Taking advantage of the lovely weather and the Bank Holiday weekend, I ventured into London once again yesterday, and did Cultural Stuff. By which I mean that I went to the National Gallery. And it was there that I found out several fascinating things. Pictures of Mary and the infant Jesus were remarkably popular a few hundred years ago. Almost without exception, the infant Jesus is portrayed in these pictures as either gigantic, or terrifying, or sometimes (for bonus points) both. A subset of these pictures involve Mary nursing Jesus. The artists who produced these ones seem to have had some very funny ideas about female anatomy. One in particular (which I sadly can't find on the National Gallery website) appears to suggest that Jesus was able to feed by suckling Mary's collarbone. Not only is Adam sporting a fine 'fro, he also seems to have just as well-developed a chest area as his wife. Maybe Gossaert only knew extremely thin women or something. 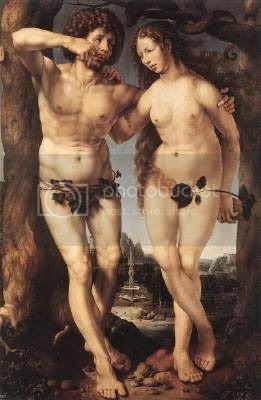 And those trees are clearly both sentient and easily embarrassed. Seeing a painting in the gallery lets you pick up on all sorts of details that you might otherwise miss. 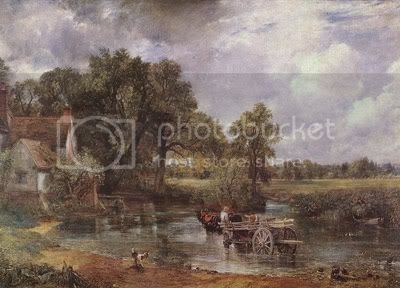 This, for example, is John Constable's The Hay Wain. Time for boring copyright stuff! So, none of the images here are covered by the blog's CC licence. I reckon all of them are, for this specific use, covered by the Fair Dealing provision of UK law (and in any case they're hosted on Photobucket, which is a US-based service, so fair use probably applies too). 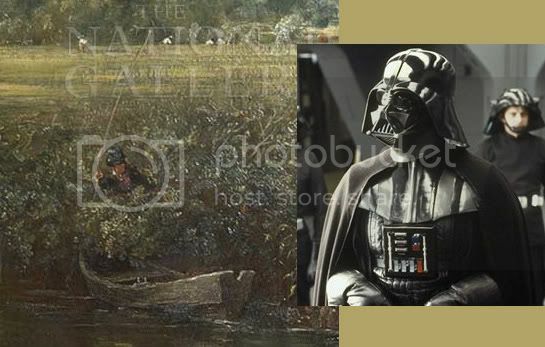 As you can tell from the watermark, the detail from The Hay Wain was unceremoniously yoinked off the National Gallery website. Everything else is either from Wikipedia or from other online image repositories (or in other words, I can't quite remember).